Parents with toddlers who are now ready to sleep on their own beds tend to get a lot more excited than their kids. The natural reaction to this would be heading straight to the shops and find the cutest bed for their child. A lot of energy and inspiration from wanting to give their child the best may help them to get a good bed for their toddler, but it actually takes more than that to get the right one. Doesn’t the cuteness of your toddler just inspire you to get a bed that’s just as cute and adorable? This may sound funny but a lot of parents –with all the excitement, will most likely aim for really fun and creative toddler beds. This could be a basis for choosing the right bed for their child but focusing on the look of the bed alone may lead you to miss out on more essential details. The first thing you should keep in mind, being the parent of that toddler, is safety. Just because you’re child is bed-ready does not mean the child can be left alone. Toddlers still need constant supervision and they need to be able to feel secure in their beds. Falling out of beds will not only lead to physical injuries, but it can lead to psychological traumas as well. Though domes and tents as an accessory to a toddler’s bed may be fun it may not be the safest option. When your child begins to explore the environment you need to be able to see the things surrounding your child, the things being touched and put in the mouth. Covering the bed is never a good idea for toddler beds. At amazon.com you will be able to find a classic design for a toddler’s bed which has all the needed comfort and safety features. It is simple and economical as well. The classic sleigh toddler bed may look like a simple kind of bed but it can effectively accommodate your toddler and leave you worry free. One of the first reasons why I would recommend this bed to parents is its simplicity. I understand how you’d like to be very creative for your child but then you also have to consider that the creativity you are aiming for comes from you. This is your toddler’s bed and so you have to consider what they may or may not appreciate. With several cartoon characters on television nowadays your toddler’s interest is bound to change at one point or another. Getting a classic sleigh design bed will keep the bed neutral. I think you’d agree that changing sheets is a lot more affordable and convenient than having to change beds. When it comes to safety, you won’t have to worry about your toddler falling off the bed. The bed is built low and there are side railings to keep your child from falling, just add a few cushions or pillows and even your little restless sleeper won’t fall off. The wood comes with a classic touch and so it is still stylish. 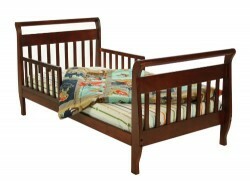 The Classic Sleigh Toddler Bed has exactly what parents need for their child –style and safety. It may not be loud on creativity and animation but it will assure you that your toddler will be able to sleep safe and sound on this bed.